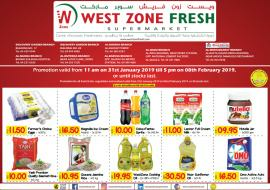 West Zone Fresh Supermarket Offer. Promotion valid from 11 am on 11th April 2019 till 5 pm on 16th April 2019, or until stocks last. 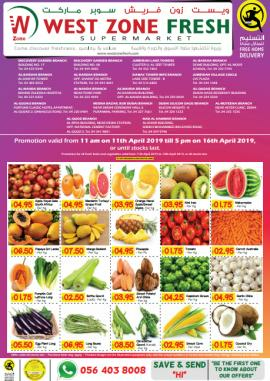 Promotion for all fresh fruits and vegetables valid from 11th April 2019 to 13th April 2019, or till stocks last. West Zone Fresh Supermarket Promotion. Offer available branches: Discovery Garden Branch, Al Barsha Branch, Damac Tower-IMPZ Branch Al Nahda Branch, MBK Tower, Meena Bazaar, Bur Dubai Branch, Al-Muteena Branch, Al Qusais Branch, AL Quoz Branch, Al Satwa Branch, Al Muraqqabat Branch. Promotion valid from 4th April 2019 till 6th April 2019, or until stocks last. West Zone Fresh Supermarket Promotion. 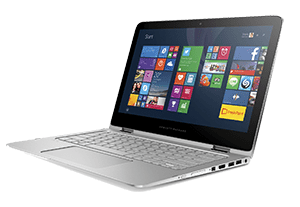 Offer available branches: Meena Bazar - Bur Dubai and Al Qusais. Promotion valid from 11 am on 27th March 2019 till 5 pm on 5th April 2019, or until stocks last. 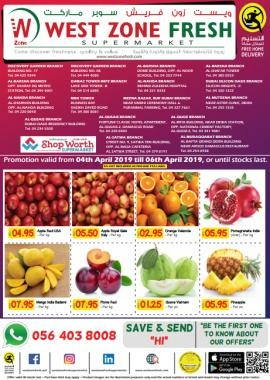 Promotion for all fresh fruits and vegetables valid from 27th March 2019 to 30th March 2019, or till stocks last. West Zone Fresh Supermarket Promotion. Offer available branches: Discovery Garden, Al Barsha, Al Nahda - behind Zulekha Hospital, DAMAC Tower-IMPZ, MBK Tower - Business Bay, Dubai Silicon Oasis and Al Sharhan Building - Al Nahda. Promotion valid from 11 am on 28th March 2019 till 5 pm on 5th April 2019, or until stocks last. 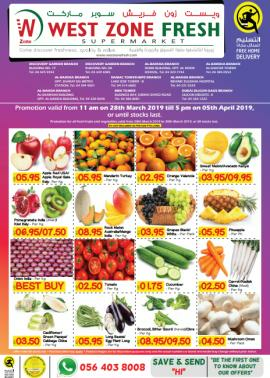 Promotion for all fresh fruits and vegetables valid from 28th March 2019 to 30th March 2019, or till stocks last. West Zone Fresh Supermarket Promotion. Offer available branches: Al Nahda Branch Near Pond Park, Nad Al Hammar, Jumeirah Lake Towers and Jumeirah Village Circle. Promotion valid from 11 am on 28th March 2019 till 5 pm on 5th April 2019, or until stocks last. 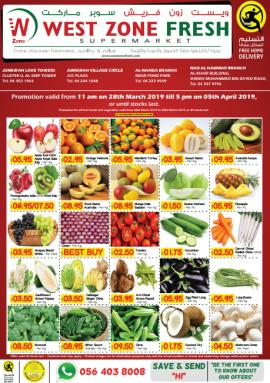 Promotion for all fresh fruits and vegetables valid from 28th March 2019 to 30th March 2019, or till stocks last. West Zone Fresh Supermarket Promotion. Offer available branches: Meena Bazar - Bur Dubai, Dubai Silicon Oasis, Al Nahda Branch - Al Sharhan Building and Al Qusais. 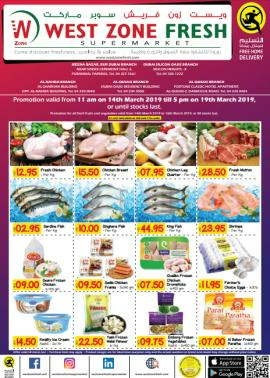 Promotion valid from 11 am on 14th March 2019 till 5 pm on 19th March 2019, or until stocks last. 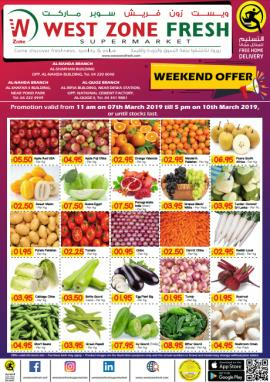 Promotion for all fresh fruits and vegetables valid from 14th March 2019 to 16th March 2019, or till stocks last. Fabulous Offers. 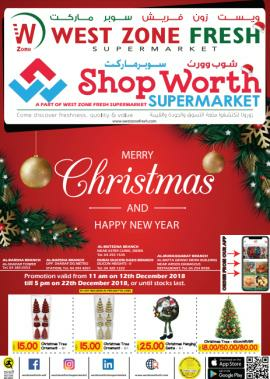 Offer available at SM Supermarket & New West Zone Supermarket - Abu Dhabi. Offer valid from 7th March to 14th March 2019. 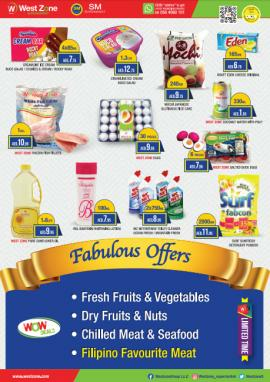 West Zone Fresh Supermarket Weekend Offer. Offer available branches - Al Quoz, Al Nahda Branch Near Pond Park & Al Sharhan Building. Promotion valid from 11 am on 7th March 2019 till 5 pm on 10th March 2019, or until stocks last. West Zone Fresh Supermarket Promotion. Offer available branches: Meena Bazar - Bur Dubai, Dubai Silicon Oasis, Al Nahda Branch - Al Sharhan Building and Al Qusais. Promotion valid from 11 am on 27th February 2019 till 5 pm on 05th March 2019, or until stocks last. 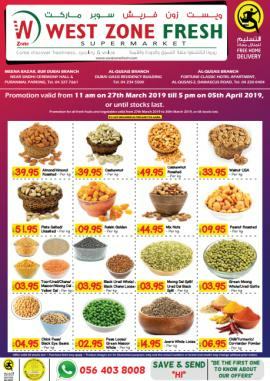 Promotion for all fresh fruits and vegetables valid from 27th February 2019 to 02nd March 2019, or till stocks last. West Zone Fresh Supermarket Promotion. Offer available branches: Discovery Garden, Al Barsha. 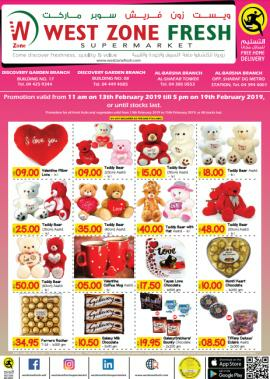 Promotion valid from 11 am on 13th February 2019 till 5 pm on 19th February 2019, or until stocks last. 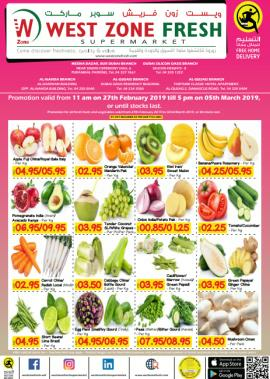 Promotion for all fresh fruits and vegetables valid from 13th to 15th February 2019, or till stocks last. West Zone Fresh Supermarket Promotion. Offer available branches - Dubai Silicon Oasis, Al Nahda Branch Near Pond Park & Al Sharhan Building, Dubai Oasis Residency - Al Qusais. Promotion valid from 11 am on 30th January 2019 till 5 pm on 08th February 2019, or until stocks last. Promotion for all fresh fruits and vegetables valid from 30th January 2019 to 02nd February 2019, or till stocks last. West Zone Fresh - Super Saver. Offer available branches: Discovery Garden, Al Nahda - behind Zulekha Hospital, Al Barsha - Al Shafar Tower & Opp. Sharaf DG Metro, Al Muteena, Al Muraqqabat, Al Quoz. Promotion valid from 11 am on 31st January 2019 till 5 pm on 08th February 2019,or until stocks last. 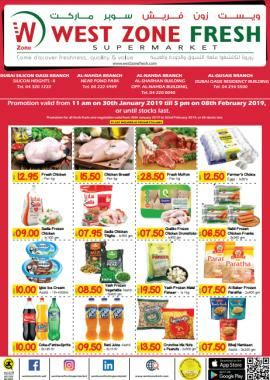 Promotion for all fresh fruits, vegetables and seafood valid from 31st January 2019 to 02nd February 2019, or till stocks last. West Zone Fresh Supermarket Promotion. Offer available branches: Meena Bazar, Bur Dubai branch and Al Qusais. Promotion valid from 11 am on 24th January 2019 till 5 pm on 02nd February 2019,or until stocks last. 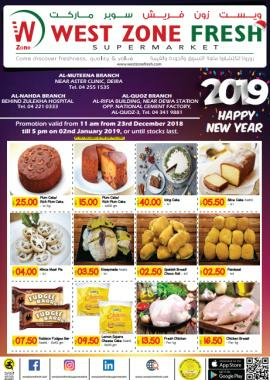 Promotion for all fresh fruits, vegetables and seafood valid from 24th January 2019 to 26th January 2019, or till stocks last. 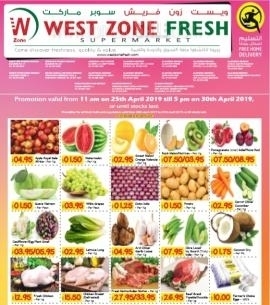 West Zone Fresh Supermarket - End of Season offer. Promotion valid from 11 am from 23rd December 2018 till 5 pm on 02nd January 2019, or until stocks last. Offer available branches: Al Muteena, Al Quoz, Al Nahda - behind Zulekha Hospital. 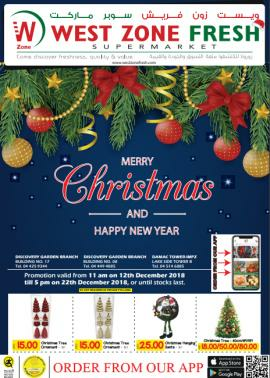 West Zone Fresh - Christmas Sale. Promotion valid from 11 am on 12th December 2018 till 5 pm on 22th December 2018, or until stocks last. Offer available branches: Al Barsha - Al Shafar Tower, Al Barsha - Opp. Sharaf DG Metro, Al Muteena, Al Muraqqabat, Dubai Silicon Oasis. West Zone Fresh Supermarket - Christmas Sale. Promotion valid from 11 am on 12th December 2018 till 5 pm on 22th December 2018, or until stocks last. Offer available branches: Discovery Garden, DAMAC Tower-IMPZ. West Zone Fresh Supermarket Promotion. Offer available branches - Bur Dubai, Dubai Silicon Oasis, Al Sharhan Building - Al Nahda, Dubai Oasis Residency - Al Qusais. Promotion valid from 28th November 2018 till 07th December 2018,or until stocks last. 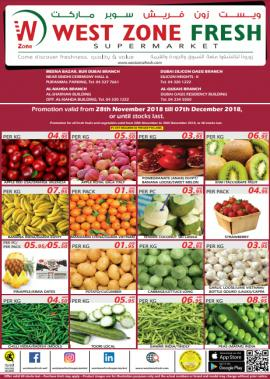 Promotion for all fresh fruits and vegetables valid from 28th November to 30th November 2018, or till stocks last. West Zone Fresh Supermarket Promotion. Offer available branches - Al Muteena, Al Quoz, Satwa. Promotion valid from 28th November 2018 to 07th December 2018, or until stocks last. 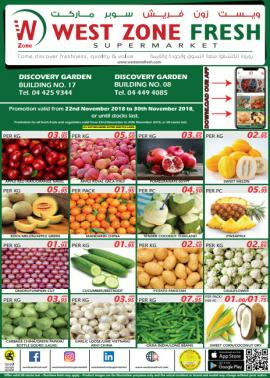 Promotion for all fresh fruits and vegetables valid from 28th November to 30th November 2018, or till stocks last. 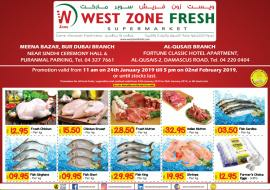 West Zone Fresh Supermarket & Shop Worth Supermarket Promotion. Offer available branches - Nad Al Hammar, Al Nahda Branch (Near Pond Park), Al Mamzar Branch (Shop Worth Supermarket ). Promotion valid from 29th November 2018 to 07th December 2018, or until stocks last. 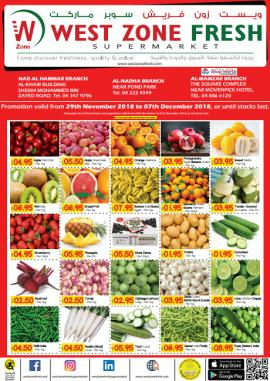 Promotion for all fresh fruits and vegetables valid from 29th November to 01st December 2018, or till stocks last. West Zone Fresh Supermarket Promotion. Offer available branches - Discovery Garden. Promotion valid from 22nd November 2018 to 30th November 2018, or until stocks last. 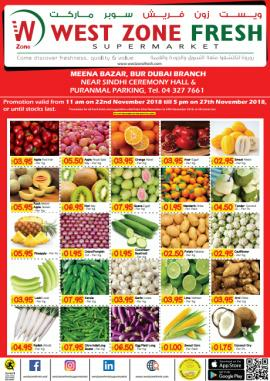 Promotion for all fresh fruits and vegetables valid from 22nd November to 24th November 2018, or till stocks last. West Zone Fresh Supermarket Promotion. Offer available at Meena Bazar, Bur Dubai branch. Promotion valid from 11 am on 22nd November 2018 till 5 pm on 27th November 2018, or until stocks last. 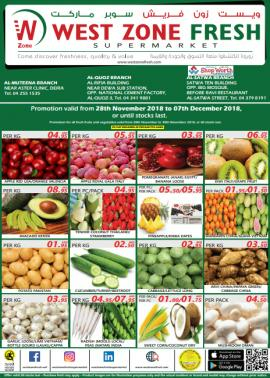 Promotion for all fresh fruits and vegetables valid from 22nd November to 24th November 2018, or till stocks last. West Zone Fresh Supermarket Promotion. Promotion valid from 11 am on 31st October 2018 till 5 pm on 10th November 2018,or until stocks last. 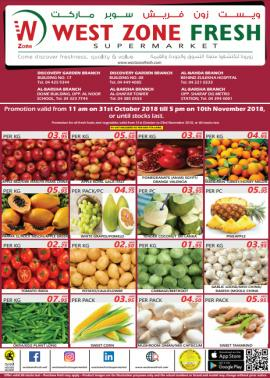 Promotion for all fresh fruits and vegetables valid from 31st October to 03rd November 2018, or till stocks last. Offer available branches - Discovery Garden, Al Barsha. 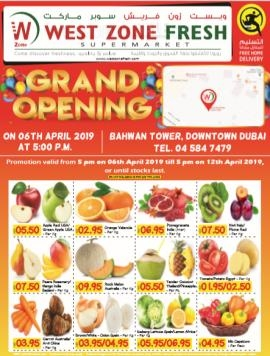 Get all information about West Zone Fresh Supermarket sale in Dubai, West Zone Fresh Supermarket Supermarket special offers, West Zone Fresh Supermarket latest offers in UAE, West Zone Fresh Supermarket catalogue and West Zone Fresh Supermarket promotions by browsing through TomatoSALE.